Finally finished – the second of the “floating quilts”. The first one is smaller with 2 rows of 4 rectangle. This one has 3 rows of 5 rectangles. 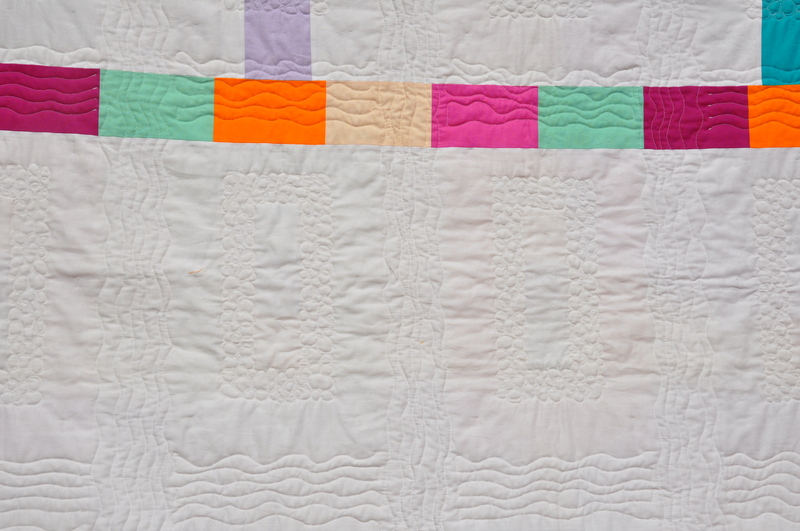 The blocks and sashing in both quilts are the same size. This is my experiment – I wanted to see in reality not only the differences in the size, but also in the quilting technique. I quilted the small one with a walking foot with straight lines, the big one is free-motion quilted. I decided to quilt only the white fabric with two patterns : pebbles (white fabric in the rectangles) and waves (sashing). I have used my new thread from Superior Threads So Fine! #50 in white and I am happy with the result. 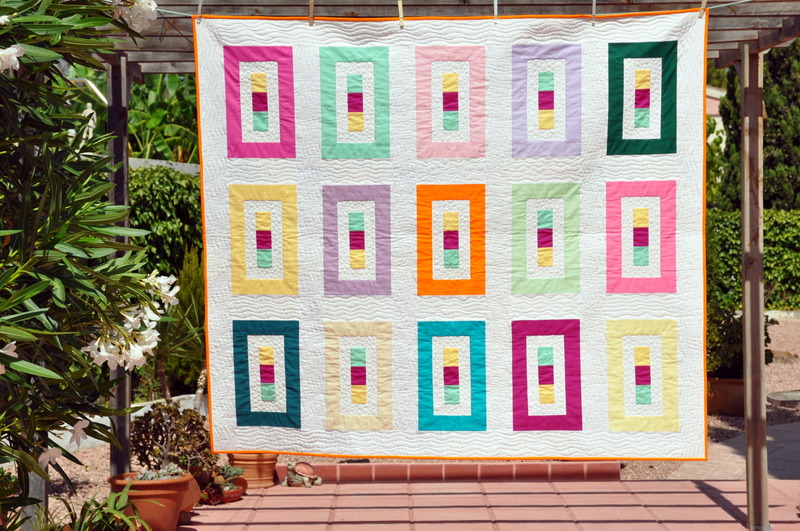 The quilting looks finer and the thread does not stand out. 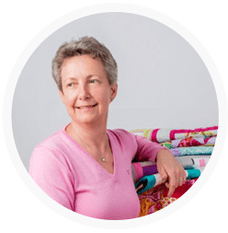 I think I shall use the thicker thread (a #40 or #30) for straight line quilting or free-motion quilting with a larger pattern and the #50 thread for fine, dense quilting. I have updated my Etsy and Dawanda shops. Now I have to get back to my quilting room and tidy it up !!!! This entry was posted in patchwork, quilts and tagged finished quilt, thread. 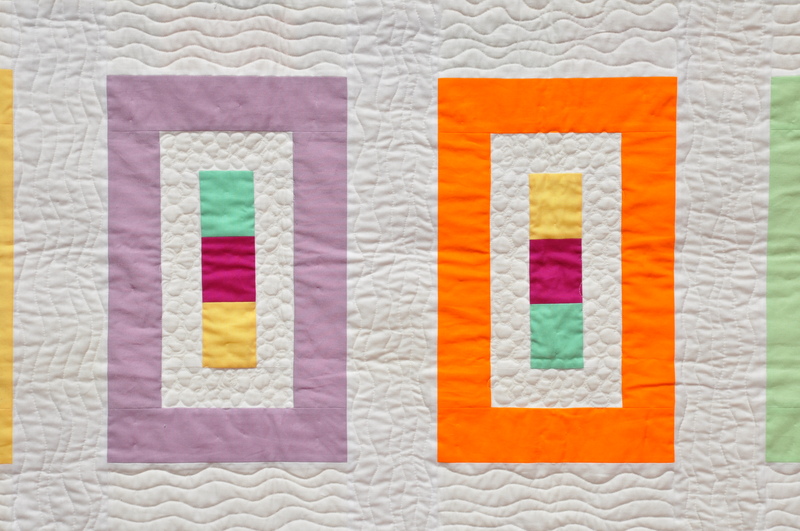 I love the floating rectangles and your quilting. Lovely. Thanks! I like the paper piecing you are working on! August is a holiday month in Spain. All is to “normal” when the kids are back to school. Lets wait what September brings, maybe some new bloggers. Dogs are such a good company, I don’t want to miss mine.